Harmony Blinds are proud to be members of the British Blind and Shutter Association (BBSA) and fully support the Make It Safe campaign, which is raising awareness about the potential dangers of looped blind cords. As an accredited member of the BBSA, we at Harmony Blinds have been closely involved in the Make It Safe campaign and the changes required in the way internal blinds are made, sold and professionally installed. We manufacture an extensive ranges of products that are safe by design, meaning that they do not use operating cords or chains or have concealed or tensioned cords. We strongly recommend that these products are always considered first when you are buying new blinds for homes or public buildings. If you're buying new blinds from us, they will be cordless*. Make it Simple, Make it Safe. Combining the tilt chain and the draw cord of a vertical blind, the monowand system is completely safe for children. It is also easy to use, simply pull the louvres back and forth to open and close the blind, and twist the wand to tilt the drapes. Perfect Fit Blinds are completely child safe blinds. The blind itself is put into a frame which clips into the bead of your window. There are no looped cords at all in the product, all operation of the blind is by hand. Completely remove the looped cord and replace it with a spring-loaded mechanism which is easily operated by gently pulling the blind. 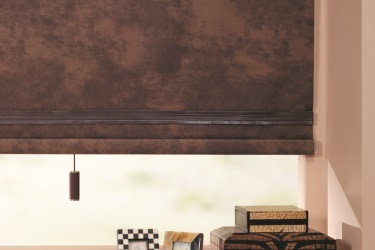 Also Safe by Design are Senses roller blinds which are similar to regular roller blinds, however, they have a integrated cassette at the top, and their spring system is a slow-rise. *Cordless products aren't always practically applicable. Wherever this is the case, we will have to take measures to ensure the blinds are compliant. 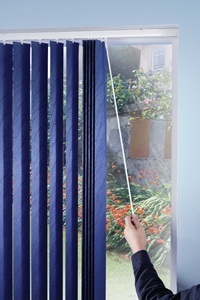 Harmony Blinds of Bristol also provide a range of safety devices, free of charge, which have been tested to the new mandatory standards and can help to make existing blinds safer. There are options for virtually every style of blind so you do not have to wait until you change your blind to make it safer. Please contact us or visit one of our showrooms to make your blinds child safe. If you would like to get a Child Safe Blind device - Free of Charge - Call us today on 0117 931 4141 or visit us at one of our showrooms. 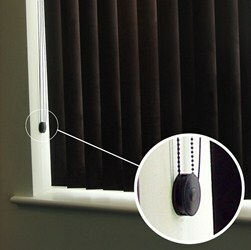 Available for any blind type with free hanging cords, the cleat is a simple yet effective way of making blinds safe. It is attached to a nearby wall, within reach of the blind's cord. Then when the cord is not in use, the cord is wrapped around the cleat, keeping it out of the reach of little hands. The cord tidy works in a similar manner to the cleat. However, the cords or chains are permanently held between the device's walls so that they never dangle freely. The blind's general operation is unhindered by this device as it allows the cord to run through it freely. If fitting blinds yourself, please make sure that you follow the installation instructions carefully and make sure any safety devices supplied are correctly installed. Do not place your child’s cot, bed, highchair or playpen near to a window blind. Make sure all cords and chains are always secured out of reach of babies and young children. Do not tie cords or chains together. Make sure cords or chains do not twist and create a loop. Do not put other furniture near to a window blind as children love to climb. Other Useful resources about Child Safety, Child Safe Blinds and the Make it Safe Campaign.